The History of "Shingle Diggins", "Dickerville", or Coloma as it is known today, is unique and a genuine part of yesteryear's America. 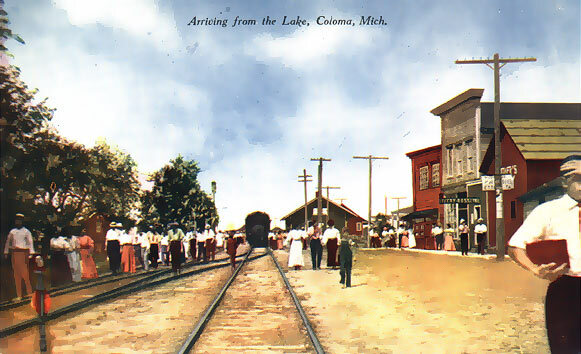 The first English settlers in the Coloma area were Mr. & Mrs. Job Davis in 1832. They bought 150 acres along the Paw Paw River and built a mill to make wooden shingles. With the help of local Indians, they planned to float these shingles down river to sell in St. Joseph, Michigan. During the first year of operation, Mrs. Davis died and Mr. Davis, although his enterprise had grown to include several more pioneers, abandoned the effort. In 1833, a search for someone to head the project brought in Stephen R. Gilson of New York, whose energy and business knowledge made the operation very successful. In 1837 alone, "Shingle Diggins", as this operation and community had become known, turned out 1,300,000 hand split wooden shingles. Shingle Diggins was so successful, the operation had to close in 1838 because all the area's suitable timber had been depleted and the mill community ceased to exist. In the early 1840's the settlers sought a new location for their town. They chose a location across the river, which is the Tannery Creek area. Stephen Gilson, who had brought his family from New York, built one of the first houses nearby. By the late 1840's a commercial development had began along Tannery Creek with water-powered sawmill owned by Stephen Gilson and a partner, Gilson Osgood. 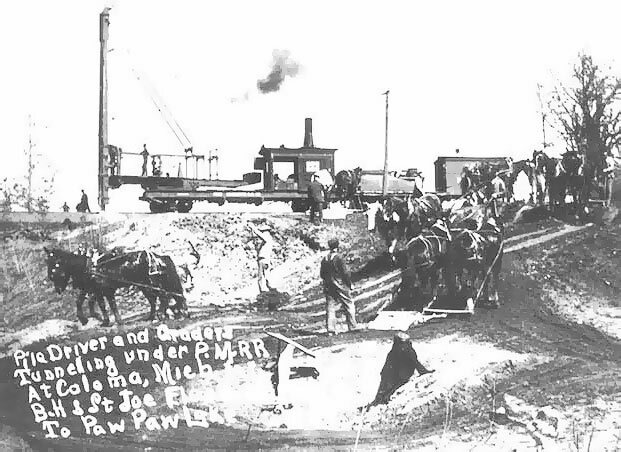 Osgood built a hotel for stagecoach travelers riding between Paw Paw and St. Joseph, on what is now Red Arrow Highway. This was a convenient stop for travelers allowing them rest, to buy a meal and rent a room in Shingle Diggins. The hotel was the Osgood House. There was also a store where travelers and local residents could obtain needed supplies. As actual paper money was scarce and unreliable, shoppers would trade or "dicker" with the storeowners for purchases. This manner of exchange resulted in Shingle Diggins now being referred to as "Dickerville". 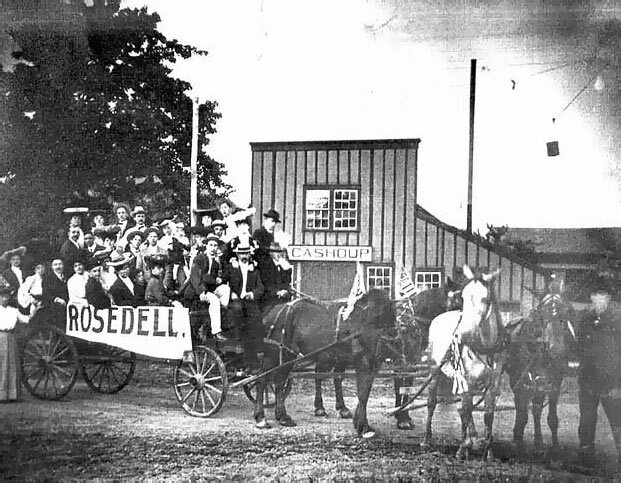 The Dickerville name remained until the 1850's when the town was to be assigned a post office. The town's people wanted the post office but didn't want to be officially known as Dickerville. So, a new, more suitable name had to be selected. Miss Gilson, recalling stories of the 1849 Gold Rush, remembered her father comparing Dickerville to that of Coloma, California. 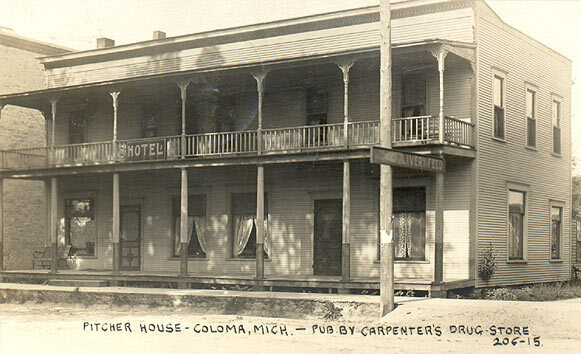 The name was then changed from Dickerville to "Coloma". In Spanish, Coloma was also the name of a fragrant and beautiful flower, which grew on the Pacific slopes. 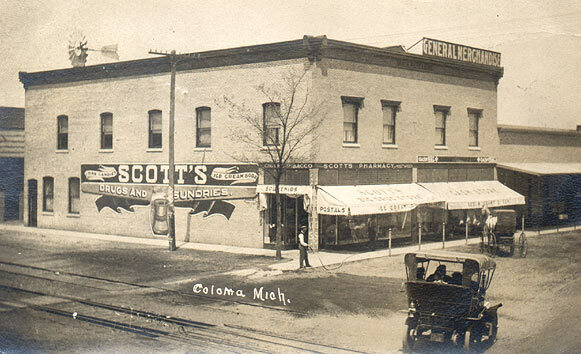 In 1871 when the Chicago and West Michigan Railroad came through the area, Coloma's businesses moved again to be near the railroad tracks. Some of the buildings were, in fact, physically moved to the new location. 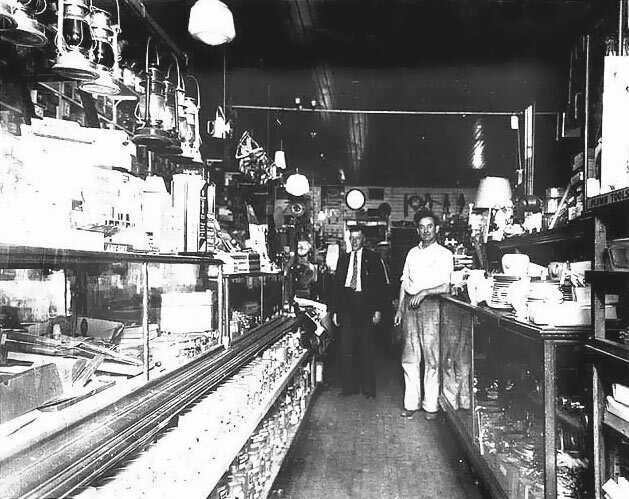 By the 1880's merchants had moved once again to the present downtown location on Paw Paw Street. 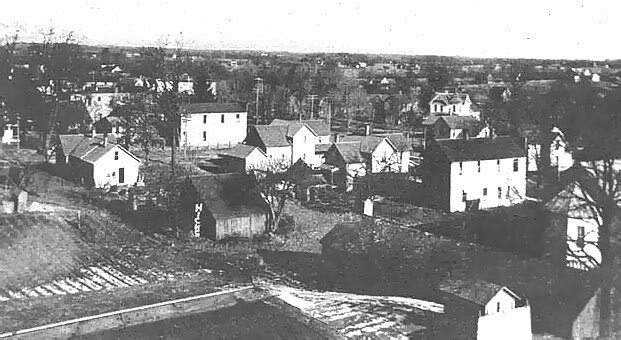 Through the rest of the century and into the 1920's the town continued to grow. 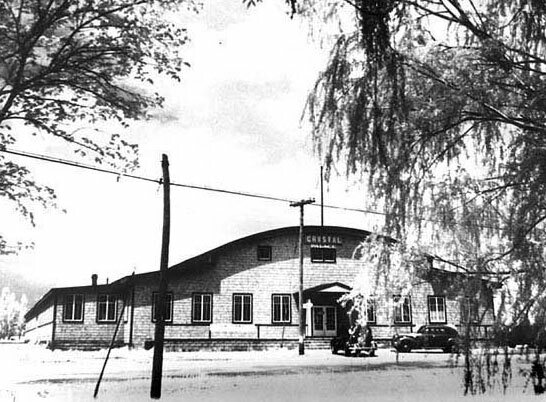 A basket and ladder factory, canning company and pickle plant were just some of the new businesses that brought people to live and work in Coloma. 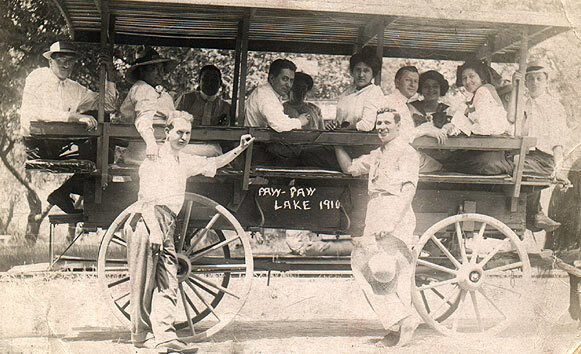 In the late 1880's and early 1890's, Chicagoans, looking to escape the summer winds of the "Windy City", began coming to Coloma's beautiful Paw Paw Lake. Area farmers began renting rooms to visitors, as there were not enough available elsewhere. By 1895, the resort business developed so rapidly that hotels and pavilions were under construction all around the lake. Double-decked steamboats of up to 90 feet in length were circling the lake on a regular schedule. Summer visitors came in such large numbers, that one boat captain founded a railroad, which ran from Coloma directly to his boat dock. 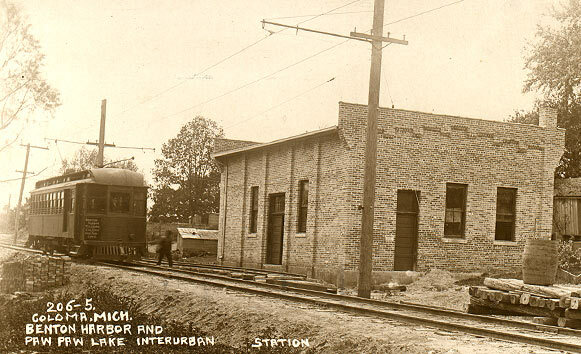 Vacationers also came to town by the Electric Interurban Train or by regular passenger trains. 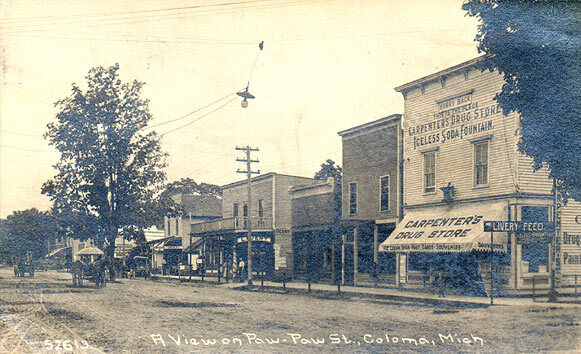 Summer weekends found Coloma crowded with thousands of vacationers who came to enjoy Paw Paw Lake and all that the area could offer. Later in the 1920's and throughout the 1940's, the best Big Bands in the country vied for any opportunity to play before the crowds at the Crystal Palace, Woodward and Edgewater pavilions. Today, handsome homes and condominiums accommodate year around residents.